Couldn’t get reservations at our first choice for our first outing as a group of regulars in a while. The cooking channel's Unique Eats provided us with another option in The Washington Place Inn and Bistro in Little Italy in Cleveland. So the six of us assembled to ruin a couple of diets and enjoy each other’s company for the first time in a long time, How much did the food take part in our evening's adventure? That’s to come. Just off of Murray Hill in Little Italy the Bistro is housed in a pretty sharp building both outside and in. We were led to one of many small rooms full of tables and perused the paper versions of the menus we had checked out online. Catching up kept us from working out our orders quickly but eventually we managed a half dozen appetizers and entrees to match. The service was actually fine if a little distant but teamwork kept things moving along pretty well. 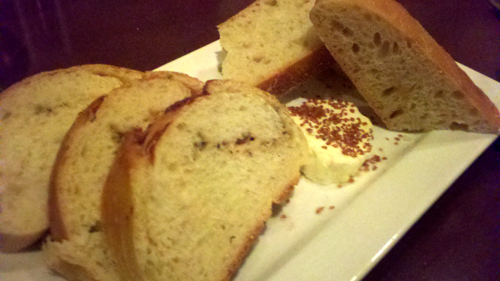 Bread of two stripes was delivered to the table with a roasted garlic butter peppered with what appeared to be Hawaiian alaea sea salt. Not bad. We were soon passing around oxtail pierogies, sweet and sour chicken livers, pork and sauerkraut, mussels, fries and Ahi poke as our appetizers. The appetizers were probably the best part of the meal. 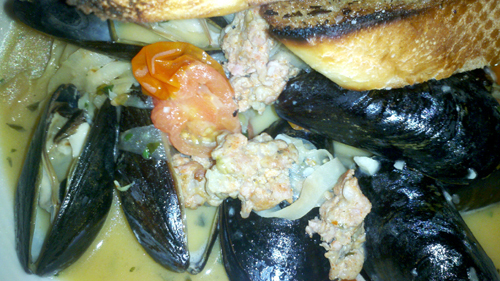 The mussels were average at best and were let down by a lack of flavor in the chorizo which would be a theme for the evening. The washings from the steaming liquid that had pooled at the bottom of the bowl would turn out to be one of the most flavorful bites of the evening when sopped up with the baguette. 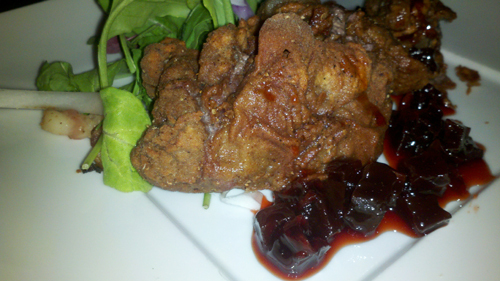 The chicken livers were actually kinda awesome served with a gastrique, red onions, warm arugula & smoked bacon salad but having had the dish at Greenhouse Tavern, there is just no comparison. Crispy exterior, hot meaty innards, a well done dish. 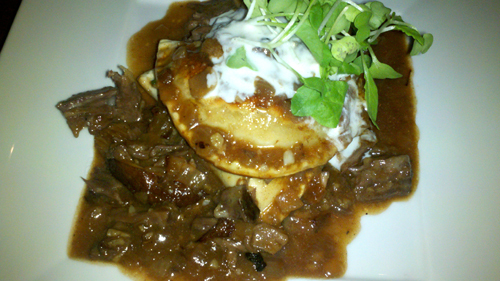 The oxtail pierogies weren’t bad either, tender ox and mushroom ragout, tater filled pasta pillows, onion and horseradish, it could never hope to match the same dish at Lola but was a high mark comparatively here. 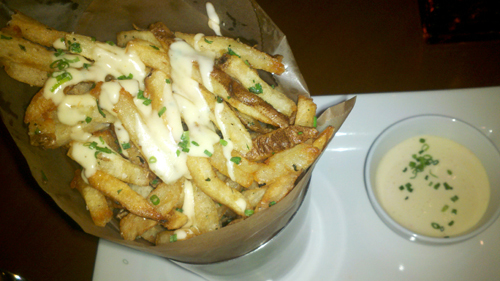 The fresh cut fries were actually very nice and were made special by the malt vinegar aioli, yes, malt vinegar mayo. Fatty, rich and sharply pungent all in the same bite really made well done fries sing. 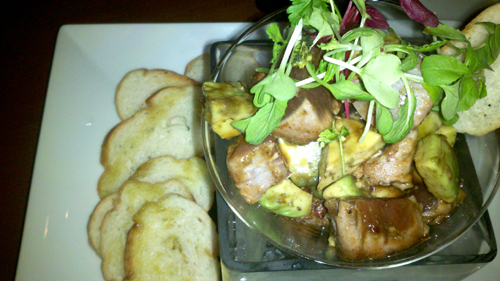 The Ahi Poke was also a nice dish. A dusting of five spice was just seared into the into the outer edge of the fish and then tossed on a citrusy ponzu sauce. Actually pretty tasty. One of the apps I was most looking forward to was the pork and sauerkraut. 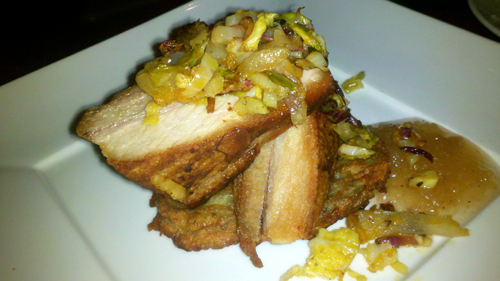 Listed on the menu as crispy pork belly with a fennel & brussels sprout kraut, it was served on a potato latke, with spiced apple preserves. When they delivered it to the table the manager dropped it off and said we would be “fighting over this one”. We did fight…to chew it. First it was neither crispy nor sauer. What it was, was dry and hopelessly flavor deprived. Really bad. On the whole, I wasn’t wowed or impressed by the appetizers but honestly the majority of them were not bad, if only things had continued that direction. Here come the entrees. 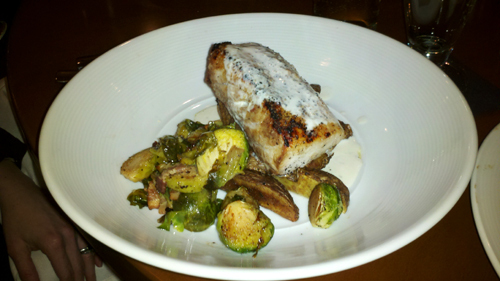 The daily special grilled cobia, duck breast, mack [sic] and cheese, braised pot roast, veal rack and hanger steak. 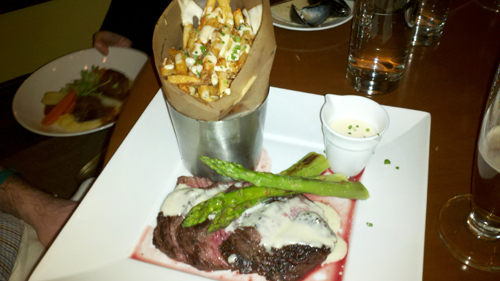 The beef in the steak and roast were well done and tasty in a cowy kinda way and the steak came with the same fries and aioli from the appetizer, appetizing. That’s where the positives stopped. The sides, peppered potatoes, mash, croquettes, and veggies were incredibly uninspired and lifeless. The fish was stupendously boring as was the veal. Yes, veal is mildly flavored, which is why most folks look to draw out more of the essence or dress it up with something else, none of that happened here. 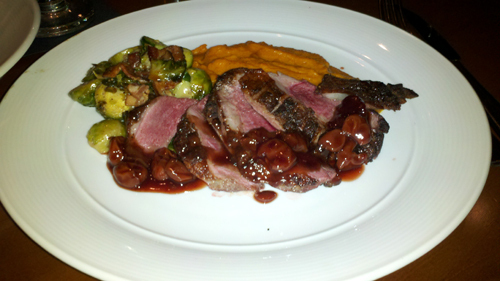 The duck breast looked great but was rubbery and failed to deliver any noticeable rich duckiness, tragic. 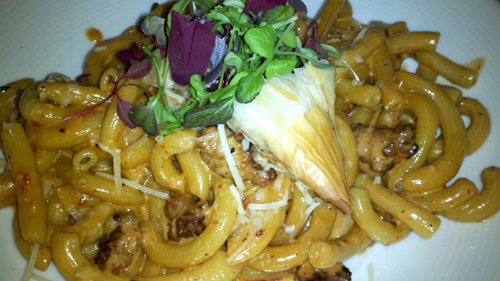 The episode of Unique Eats featured three dishes, only one of which was still on the menu, the Mack and Cheese. Looks great on the show, the ingredients sound interesting and potentially fantastic together…Mackenzie and Baricelli cheeses, chorizo and little phyllo dough strudels stuffed with goat cheese and chorizo. This was certainly going to be the reason to come. It wasn’t bad, it was more way, way, way disappointing. The chorizo has no bite, the cheeses don’t really stand out or meld into much, the strudel was crispy but really should taste of something as well. Not worth the drive. 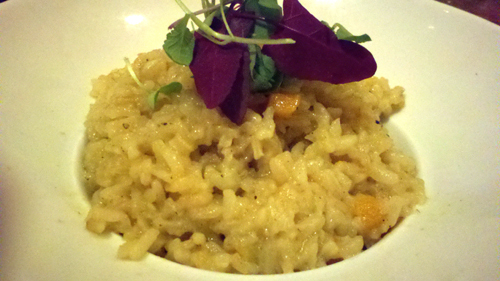 Steph ordered a side of butternut squash risotto and one of our companions joked about risotto being the dish in so many cooking competitions that sends somebody home. Washington Place would be the dreaded first one out. Entirely over cooked and mushy, no flavor left from the rice or the squash, one of the worst I have ever had. Entrees were inadequate why do dessert? Cause it’s what we do. You never know when you might find a little treasure. 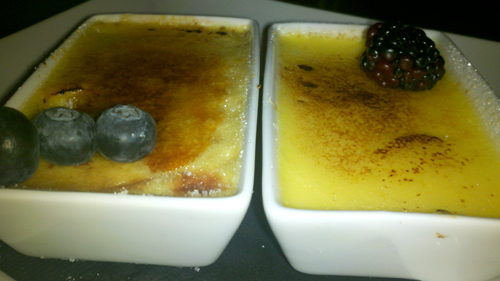 We split the crème brulee duo, the chocolate mousse, the ice cream trio, and the bread pudding. The custards du jour were vanilla and fig and were ehhh at best. 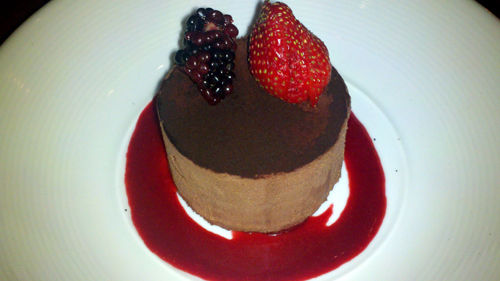 The mousse was chocolatey but lacked layer or texture to make it interesting. 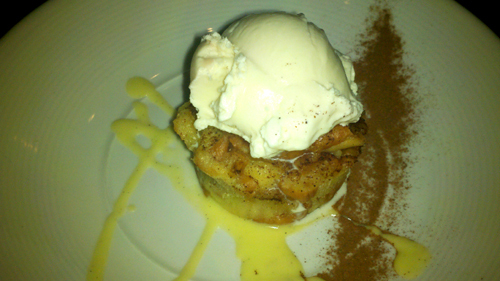 The bread pudding was made with Presti’s glazed donuts and should have been so good but the boring fairy had made another visit with just a hint of cinnamon and nothing else. The best dessert was made somewhere else. The ice creams were from Cinncinati’s Greater’s Ice Creams. Chocolate chestnut, salted caramel and goat cheese and rhubarb were pretty delicious and the caramel had some interesting notes that required a second spoon. 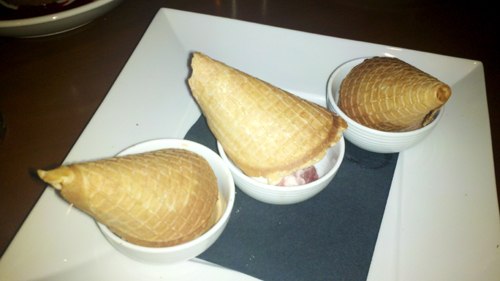 The kitchen did their best to ruin the treats as the house-made cones perched on the scoops were lousy with salt and baking soda, we couldn’t stop eating them trying to decipher how you could cram so much nasty into an ice cream cone. 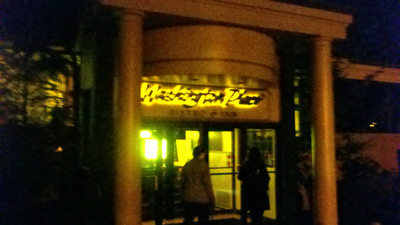 Washington Place is further proof that not every joint that makes it to television is worth the trip. The talking heads get paid to smile and wax longingly regardless of their opinions. 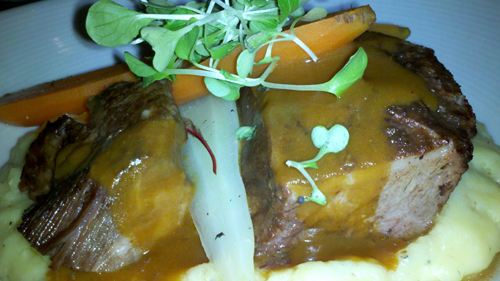 The menu is studded with key words that create excitement that never makes it to the plate. Just because you use local ingredients and source high end products doesn’t absolve you from doing something special with them. Actually, it’s more of a crime when you fail to. 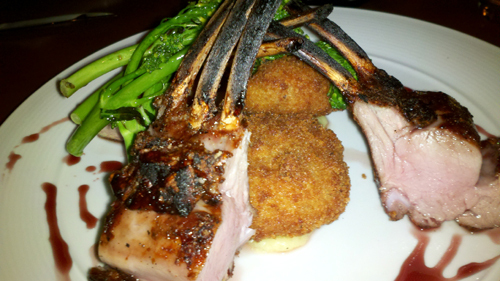 There are better places to eat on Murray Hill, by far. Washington Place didn’t pan out but we will keep going to television or friend suggested eateries. There has been much more pleasure than pain as a result. Plus even super salty ice cream cones can be a fun time when you have the right company.